It's out there calling you. You wouldn't be reading this page if you didn't feel it: The universe is pleading to be seen and understood. If you can get away from city lights on a moonless night, you'll get much closer to the cosmos. But looking up – whenever you can, from wherever you are, even for a moment – can make a huge difference in how you think about things. Experienced stargazers have found what works for them, often through expensive trial and error. Let's save you some time and money. (This guide was updated Nov. 18, 2016). "If you're just getting started in astronomy, the best thing to do is to first spend some time under the stars with just your eyes and get acquainted with the brighter stars and constellations," says Space.com skywatching columnist Joe Rao. A good astronomy app can really help you get oriented. Check out our Space.com Mobile Stargazing page to understand what they can do. Reading books, watching documentaries, or listening to podcasts on how the cosmos works can whet your appetite for seeing these phenomena for yourself. At some point, you'll probably want to go deeper than your unassisted eye can take you. The next step may be binoculars or a telescope. Choosing a quality telescope is like picking the right vehicle to drive. Do you need a compact instrument to zip around to observing sites easily? Or a big truck to haul in loads of photons from distant galaxies? Do you want to investigate planets in our own star system? Or cities of stars far away? Beginning skywatchers will need to choose between four kinds of telescopes: reflectors, refractors, hybrid and Dobsonian. Space.com's Best Telescopes for the Money can help. Be aware that a new breed of telescopes has come to market, which are driven entirely from your mobile device. Amateur astronomy is about to get very interesting! The Celestron SkyProdigy 130 is a fine example of a mid-market reflector. It sports an onboard computer to make your sky-sailing easy and fun. It aligns itself on the sky in under 4 minutes, so you don't really have to know star names to get up and running. The 5-inch (130mm) aperture is big enough to capture galaxies. Orion's SkyQuest XT8i IntelliScope is a wonderful mid-price Dobsonian, best suited to those who like to drive around the sky manually. This big "light bucket" really hauls in the photons from the depths of the cosmos. The Levenhuk SkyMatic 105 GT Mak-Cas is a great hybrid ("catadioptric"), using both lenses and mirrors to make a compact, highly portable telescope. It's SynScan computer can get you to nearly 43,000 objects under very dark skies. As an added bonus, you can use the scope to spot daylight sights – like animals or sporting events – as well. Celestron's AstroFi 90 WiFi is a classic refractor with a digital twist: You run it entirely from your smartphone or tablet. You won't need access to a network; the AstroFi scope is a network and will work even where your cellular networks don't. The 3.5-inch (90 mm) aperture and hassle-free sealed optical tube is a good choice for planet-watching. Just make sure to buy an "image-erecting" prism diagonal (like Orion's "Correct Image" diagonal) to make sure your images are right-side up and not reversed left-to-right.Space.com editors have come up with a list of some of the best telescopes for beginners. Whichever you chose, please do yourself a favor and don't buy a cheap scope from a department store. Poor optics and flimsy hardware will turn you off to the beauty and majesty of the sky before you've really seen it. Orion 1.25" 45-degree Correct-Image prism telescope diagonal. If you want to start small and portable – or feel intimidated by the idea of lugging around a big telescope – good skywatching binoculars can help. For not much money and comparatively little weight binoculars can reveal night-sky sights unavailable to the naked eye. And, of course, you can use binoculars in daylight for birding, sports, people-watching, nautical navigation and more. One of my favorite binoculars is the relatively small Oberwerk Mariner 8x40 (the numbers show you magnification). It has an extremely sharp focus, boasts great light-transmission properties and draws in a wide field. At just 5.5 inches (14 centimeters) in length, the rugged pair of binoculars makes for a good "grab-and-go" option. I use them at the telescope to spot interesting swaths of sky that I may want to investigate in fine detail. You may not need a telescope at all if you go with "large" binoculars, like the Celestron SkyMaster 25x100. You will need a tripod, and perhaps a counterweighted arm to manage these in comfort. The eyepieces of these binoculars each focus separately – it's like working two telescopes sitting side by side. Some people find this too much to deal with. You may want to look into binoculars that use a center focus knob, like Orion's 20x80 Astronomy model. Many skywatching experts swear by digital planetarium software to map out the night sky. Whether you take your laptop or tablet out with you or print out paper star charts in advance, you'll save a huge amount of time navigating to prime targets for your location and time of year. 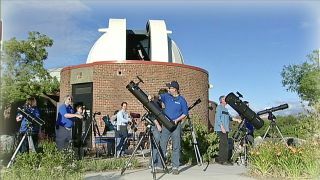 "A planetarium program such as Starry Night Pro can prove to be invaluable, displaying on monitors any number of sky objects that you might want to look at for any hour of the night," Rao told Space.com. Starry Night, a Space.com partner, makes software that lets skywatchers at all experience levels find constellations, planets and various other night-sky objects. There are also a number of Android and iOS apps for smartphones and tablets. It's very important to pick one that has a red-screen mode to preserve your dark adaptation. Now that you've got your main skywatching instrument and have some idea of what's up there for you, we need to make you comfortable out there. These aren't absolutely essential, but they each can contribute a lot to your enjoyment. If you're going with binoculars, bring a lightweight reclining lawn chair —a "lounger. "Your arms will thank you. Your back will thank you. Many a meteor shower has been won or lost based upon chair comfort! An observing chair makes stargazing easier on your neck and more comfortable in general. Telescope-jockeying skywatchers should seriously consider a purpose-built astronomy chair, especially if you own a refractor (because the eyepiece is "down" and the tube is long). The sliding seat can get low to the ground, or as high as your eye would be when standing. The best ones have a padded backrest. Where are you going to put your binoculars? How are you planning to read those star charts? When you put the iPad down, can you find it again easily? How about that coffee? Your box of colored filters? Your sandwich? This aluminum roll-up side table is available from Camping World. My favorite table for skywatching rolls up when the night is done and stuffs into my telescope bag's outer compartment. When you're observing at night, you're going to need to read a star chart or a planet finder or your telescope markings. You will need to find items like eyepieces or your coffee mug. An astronomy tool like this Celestron Astro Night Vision Flashlight goes for around $10, but there are many models to choose from and some are less expensive. This red flashlight will help your eyes stay adjusted to the dark. It takes at least 20 minutes to become dark-adapted. Some experienced observers say their eyesight doesn't peak until after more than an hour of complete darkness. A 10-millisecond flash of white light from a cellphone or car headlight can reset your eyes back to "do over." This red-lens flashlight straps around your forehead for convenient nighttime skywatching. My red-lens flashlight goes around my forehead on an elastic band. You don't even have to buy such a tool. You could make your own. It's popular among maker/DIY folks to modify an old Maglite with a bit of deep red lighting gel to suit your stargazing needs. It's an unwritten rule: the darker the observing site, the farther away it is from an electrical outlet. Bring a big battery! Units like the Orion Dynamo Pro 17 AH Rechargeable 12V DC Power Station or the Celestron Power Tank are basically bigrechargeable batteries with "lighter-style" power sockets. The Orion Dynamo Pro 17Ah Rechargeable 12V DC Power Station is available from Orion Telescopes & Binoculars. Some have 12VDC to 120AC inverters. Run your laptop, telescope, phone and other gadgets. A few boxes have USB charge ports, red and white flashlights and blinkers. Some have weather radios. They are heavy, but totally "worth the weight." Something else to plug in: Electric warming strips like the ones in the Orion Dew Zapper Pro-4 Channel Prevention System fit around four areas of the telescope. I wrap heat strips around the front objective (for a retractor), or the primary mirror (for a reflector), or both (for a hybrid catadioptric). Other heat strips go around the focuser area where the eyepieces go and the finder scope. These buy me fog-free observing time after the dew point has descended to ground level. Eventually, dew will end the night. But I can usually get at least 30 extra minutes of observing by plugging in the old Dew Zapper. Yeah, I said "cloaking device" (just to get your "Star Trek"thing going). But a wrap of fabric, with a drawstring around the open bottom, really helps. The best ones are reversible, with a silver reflective side and a dark absorptive side. Good observing nights start in the daylight with a thorough setup and check of the telescope. Then it sits — for hours — equilibrating to the lowering temperatures as the sun sets. Meanwhile, dust of all kinds has been kicked up by friends stopping by, cars pulling into the star party site, campers erecting tents; your optics will stay protected from all of that. Orion Scope Cloak Telescope Covers are available from Orion Telescopes & Binoculars. Can't tell you how many nights of great observing have been shanghaied by discomfort. Don't be that dude. I've heard electric socks work; I've used chemical toe warmers. Best for me: A thin silk sock liner inside a properly engineered mountaineering sock within an insulated rubber-sole boot (not just because I like the Beatles). You can pretty much stand anything if your feet are warm and dry. Your cellphone may save your life out there in an emergency. So keep its battery charged. But we hope nothing more than a great night of skywatching lies in store for you. A music player can keep you company; you'll find amazing correlations between what you hear and what you see in the sky. I sometimes take audio notes during particularly good observing. It keeps my hands free and my eye at the eyepiece. Even if you never transcribe them, you can listen later and relive the cold awesome night in your warm cozy bed. I'm skinny. I have bony fingers. They get cold; especially on metal telescope surfaces. But I need manual dexterity to run the cameras, futz with the focuser knob, change eyepieces and fiddle with the laptop. My solution came from an Army/Navy store: fingerless gloves with a fold-back, mitten-top covering. The guy with the black tattoos said his black-ops sniper buddies used them on cold-weather jobs. I didn't ask any more questions. OK, it's actually a fanny pack I wear backward to give me a large kangaroo pouch. Stylish, yeah, I know. Buy hey, it's dark and the only ones around are other astronomers; very few fashionistas among us. I keep certain items close at hand; easier to access than rooting around inside a pocket. The clearest observing nights are often the coldest. Insulate your outside and warm your insides! I’m a tea drinker (usually green or white). Coffee (not too strong) works, too. Máte? Kava-kava? Hot Red Bull? Consume at your own risk. Hot chocolate makes my eyes sleepy. NOTE: Alcohol is dangerous. Adult drinks can give you a false sense of warmth while actually cooling your core. Plus, you may be driving away from your dark-sky observing site when your night is over. Just say no to booze at the telescope. The universe is alive with energy. If you're comfortable, safe and properly equipped, you have established the boundary conditions for deep personal enlightenment. Have a great time, out there! May the photons be with you. Follow us @Spacedotcom, Facebook and Google+. Follow the authors of this guide @DavidSkyBrody and @MiriKramer.